This work is part of a series of visual meditations on the structure of the alternating group on 5 elements, also known as the icosahedral group. This group is the smallest non-abelian simple group, and it characterizes the orientation- preserving symmetries of the regular icosahedron and dodecahedron. It also has interesting historical significance as one of the first groups to be studied abstractly, through its connection with the theory of quintic equations. This image explores the structure of the icosahedral group through a particular presentation by two generators. 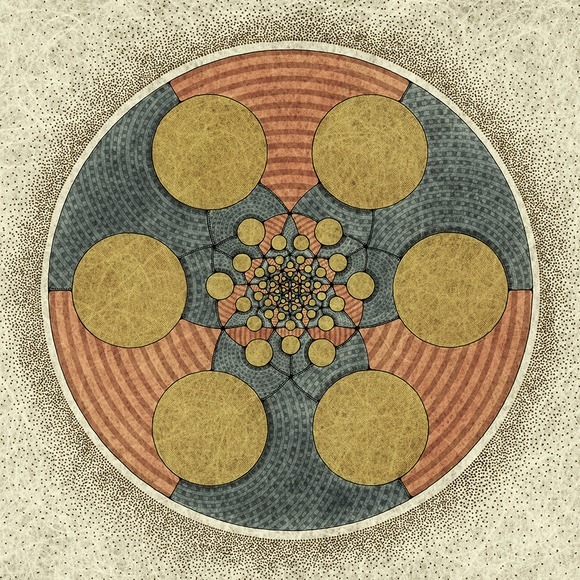 The group's elements, which appear as yellow disks in this image, are arranged at the vertices of a truncated icosahedron, shown here in stereographic projection, while the group's generators, of orders 2 and 5, correspond to the regions between the disks, colored red and blue, respectively. The image is composed of multiple hand-drawn images which are digitally composited and output as a archival digital print.